Earlier this month I had the pleasure of being part of a team of Florida grantmakers who gathered on Capitol Hill to meet with Florida’s congressional delegation, led by Florida Philanthropic Network. We were there to talk about the importance to Florida’s future of ensuring a strong and growing philanthropic sector in our state, and to discuss key legislative and policy issues that can help make that happen. The meetings were part of the annual Foundations on the Hill event put on by the Forum of Regional Associations of Grantmakers, in partnership with the Council on Foundations and the Alliance for Charitable Reform. 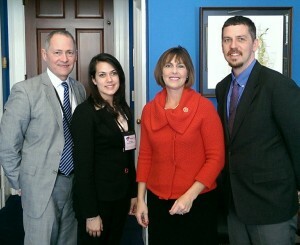 Florida Congresswoman Kathy Castor (2nd from R) discussed key philanthropy issues with (L-R) David Biemesderfer, Florida Philanthropic Network; Maria Wrabel, Jessie Ball duPont Fund; and Neil Gobioff, Gobioff Foundation, as part of the 2014 Foundations on the Hill event. Our stellar Florida team of FPN members included representatives of private independent foundations, private family foundations, corporate grantmakers and community foundations, from all parts of the state. We connected with the offices of all Florida representatives and senators, meeting with the legislators themselves and/or their staffs. First, it’s important for our congressional representatives to know who we are and understand everything that we’re doing in the philanthropic field to try to improve our communities, and to understand this on a personal level. Time after time during our Hill visits I sat in on meetings where FPN members told local stories of how they’re working to support local artists, expand access to healthcare, improve a city’s public spaces, and so much more, and you would see people’s eyes light up and get it. That’s not something that can happen with a tweet or an email. 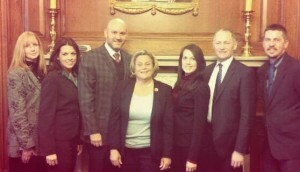 Of course we can always meet with our congresspeople back in their home districts, and we do, so why go to DC? That gets to my second point. There was definitely a power that came with our Florida delegation meeting in DC along with nearly 200 other grantmakers from across the country to present a collective voice for philanthropy. It sent a strong signal that philanthropy matters, and that we’re an important sector worth paying attention to. FPN members visited with Congresswoman Ileana Ros-Lehtinen (Center) to discuss the value of philanthropy to Florida communities and the importance of tax policy in helping philanthropy flourish in our state. L-R: Jan Preble and Gineen Bresso, Wasie Foundation; Javier Soto, The Miami Foundation; Maria Wrabel, Jessie Ball duPont Fund; David Biemesderfer, Florida Philanthropic Network; Neil Gobioff, Gobioff Foundation. Third, our legislators need to understand that federal policies, particularly tax policies, matter for philanthropy — such as the preservation of the charitable deduction — and there’s no better way to do that than to be right in front of them in Washington. There’s nothing than could have replaced us being in our senators’ and representatives’ offices just a day or two after the Chair of the House Ways and Means Committee released a tax reform package. While the proposal was fresh in people’s minds we were able to share our viewpoints on the many provisions in the package that impact charities and charitable giving, pointing out the items that concerned us and the ones we liked. And legislators from states all across the country heard the same message from our colleagues at the same time, creating a strong cumulative impact. I have seen with my own eyes the difference this can make. This year I noticed that in general our legislators and their staffers were much more aware of the philanthropic sector and much more knowledgeable on our issues than they were five years ago when Florida Philanthropic Network first took over full responsibility for leading Florida’s delegation for Foundations on the Hill. 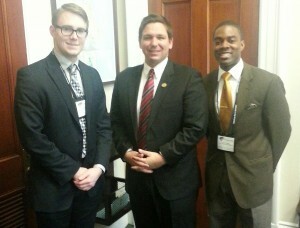 Florida Philanthropic Network’s Christopher Johnson (R) and Jessie Ball duPont Fund’s Jordan Kinser (L) meet with Congressman Ron DeSantis to discuss the role of philanthropy in his district and across the state of Florida. There’s also a practical advantage to all of this. Meeting with the office of each member of our congressional delegation is something that would take me weeks to do back home in a large state like Florida. I would to thank all of the FPN members who participated in our Florida delegation for Foundations on the Hill this year: Katie Ensign, Jordan Kinser and Maria Wrabel with the Jessie Ball duPont Fund; Gineen Bresso and Jan Preble with The Wasie Foundation; Neil Gobioff with the Gobioff Foundation; Tom Giles with the Florida Blue Foundation; and Javier Soto with The Miami Foundation. Florida Philanthropic Network remains committed to being a strong voice for Florida philanthropy with our legislators and other policymakers. We will continue to do everything we can to ensure a positive environment in Florida for strengthening and growing philanthropy. If you have any questions about FPN’s policy work, please don’t hesitate to contact me at 813-983-7396, dave@fpnetwork.org. This entry was posted in Florida Philanthropic Network, Public Policy, Regional Associations of Grantmakers and tagged Alliance for Charitable Reform, Charitable deduction, Council on Foundations, Florida Blue Foundation, Forum of Regional Associations of Grantmakers, Foundations on the Hill, Gobioff Foundation, Jessie Ball duPont Fund, The Miami Foundation, The Wasie Foundation by Florida Philanthropic Network. Bookmark the permalink.